The Ag9120-S is a module designed to extract power from a conventional twisted pair Category 5 Ethernet cable, conforming to the IEEE 802.3af Power-over-Ethernet (PoE) standard. The Ag9120-S provides the PoE compatibility signature and power classification required by the Power Sourcing Equipment (PSE) before applying up to 15W power to the port. 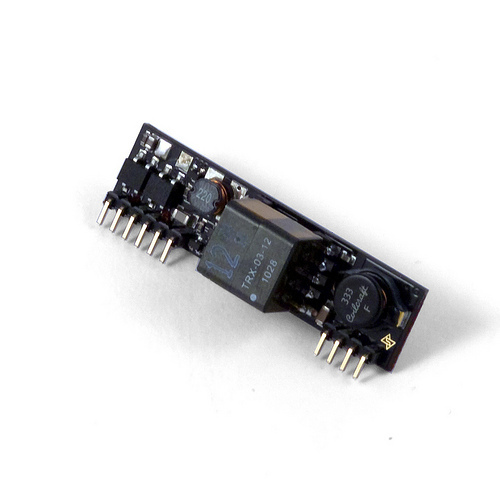 The high efficiency DC/DC converter operates over a wide input voltage range (36V to 48V typ) and provides a regulated low ripple and low noise output. The DC/DC converter also has built-in overload and short-circuit output protection.